It’s not unusual for yours truly to start an article with a movie reference—for this next title, the declining ’70s produced movies about post-apocalyptic wastelands of the near future such as Death Race 2000 and Mad Max. Not long after came games such as Car Wars and the computer game Wasteland. These all set the stage for the rise of the post-apocalypse adventure format: part western, part science fiction and filled with themes of the downfall of civilization resulting from the excesses of the late ’70s and early ’80s. There’s a second thread of historical gaming that meets this one. Gamers who once loved all day play sessions of their favorite RPGs now crave the same entertainment in smaller and more time-efficient products. Runebound, Talisman, and other sandbox titles have had their sales driven by players needing that fix of an RPG in the time allowed for a single session instead of years of campaigning. Various genres have had games that resolve those needs, but the post-apocalypse setting hasn’t been afforded the same treatment. This is where Neon Dawn comes in. 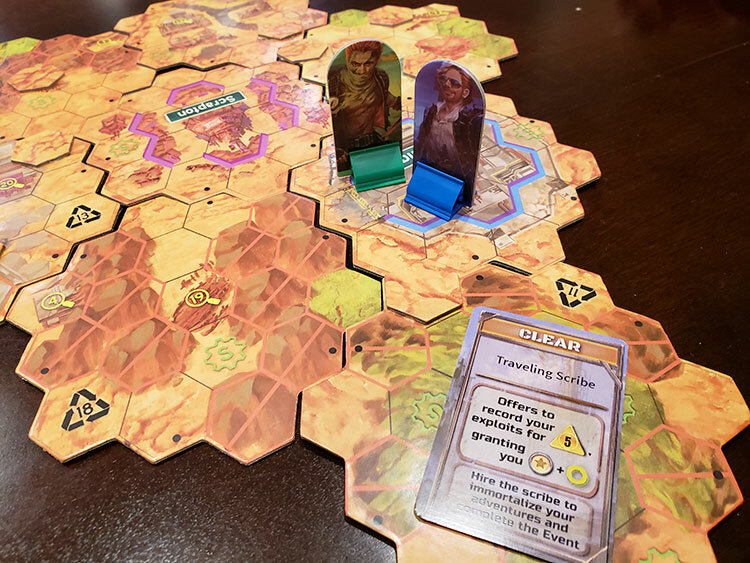 It’s an RPG board game-in-a-box that’s fueled by the nostalgic love of a solo warrior venturing forth in the wasteland with only a goal of survival. 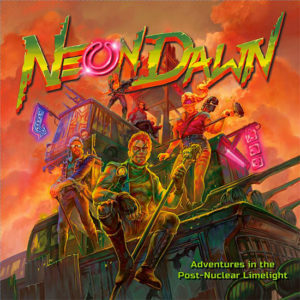 Here, Neon Dawn takes the approach of allowing players to create characters, run quick location-based encounters, and compete for fame. It’s a 1 to 4 player game that takes a various amount of time depending on the length of game players want. The shortest format with 2 players takes 1-2 hours. With a full complement of players, it could be as high as 5 hours. That’s a lot of survival in the cursed earth for one box. 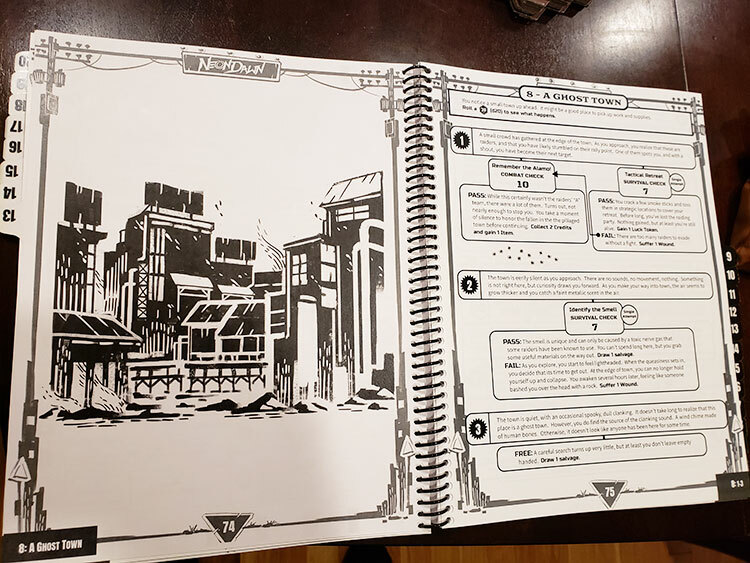 For those unfamiliar with an adventure game format such as this, Neon Dawn makes it incredibly easy to get started as long as players have the basic understanding of roleplaying game conventions. Characters are created as extremely stripped down models with abilities and equipment drafted using cards. The two primary abilities, survival and combat, are resolved with roleplaying dice such as a d4, d6, d8, d10, and d12. Bonuses are added and a target number is the goal for a roll. Most of the “Choose Your Own Adventure” style choices received in the game boil down to a die test. An included card holder makes the game refreshingly easy to setup. The board setup is also extremely easy. Seven hexagons form the core board and then are expanded upon as players take actions to scout new territory. New towns can appear as well as new locations to find scrap or adventure. Some locations are dangerously irradiated. This can cause characters to need to take longer or more dangerous routes because one of the most unpleasurable actions to be taken on a turn is moving. There are some items and companions which can speed up players travel, but the economic burden of time is definitely present in the game as the track recording turns progresses to the game end. One of the key locales to interact with are the towns which randomly appear on the map. Improving these towns and trading with them will gain resources (money and/or scrap) which can then be spent for better equipment or constructing buildings at other towns. Doing so helps other players and generates fame for a character. This is the overarching goal of the game. As players improve their characters and economy of actions, the main victory point system is fame points which are compared between characters at the end. These are counted up at the end from a variety of sources. Ultimately, the player who best takes efficient actions to generate fame should emerge victorious. Character layout is referenced on the player board and recessed boards make tracking stats effortless. What Neon Dawn does more than all else is immerse players in the wasteland. The sparse black and white line drawn graphics in the adventure book offers a huge amount of events to explore. Between play sessions, the same location on the map revolves as a result of a d20 die roll, creating an almost unrepeatable game experience. Hopefully the Kickstarter can get the standees upgraded to minis, but sometimes cards will be placed on the board to indicate persistent effects. As this is a true sandbox adventure game, players also have lots of latitude for which direction to take their characters. The creation of characters from the beginning via a draft of item and ability cards makes for a very interesting setup to the game. In addition, the world layout can dramatically change affecting which choices to make in the game. The one thing gamers should know is that despite the competitive acquisition of fame, there is not a lot of player interaction. Most of the competition comes from seeing who can achieve certain objectives first. There is also a play mode that features player-vs-player combat, but that can drag down into very arbitrary victories if one character manages to take advantage of others early. The manual shows classic art from a time when printed story books were costly. The design aesthetic really works for this game. Ultimately, the games that Neon Dawn will most recall to players minds are Xia: Legends of a Drift System, Near and Far, and Runebound. The open world for exploration, ability to build up settlements, and the randomized adventure system really make for interesting repeat plays. As such, players would likely be salivating for additional expansion content with more items and abilities the same way that Eldritch Horror works; additional cards get mixed into the various decks allowing more for repeat plays. Neon Dawn is a great introduction to adventure games. It really is a wasteland-in-a-box experience for those who miss a post-apocalyptic setting. It’s also pretty basic as a game itself, eschewing complex rules on character development for the basics of getting into the action and stories. The ability to just sit down and play as you read through the manual experience is refreshing. Mostly everything in Neon Dawn just works and the stories of survival in the dust are just waiting for the heroes. 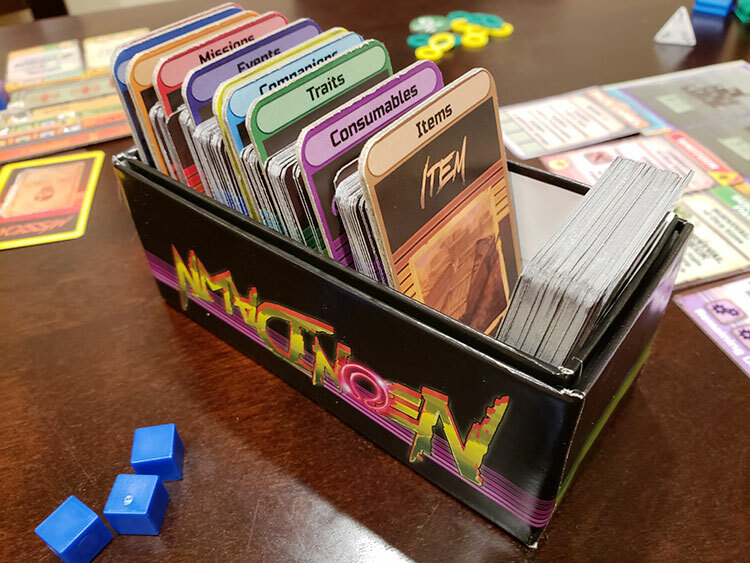 Neon Dawn launches today on Kickstarter. Check back later and we’ll update the preview with the campaign link when it’s live. Creator here! My apologies for this Kickstarter campaign. I made the (often made) mistake of setting a date on myself and making that date happen. Needless to say, I made several mistakes and the KS campaign was not what it should be. 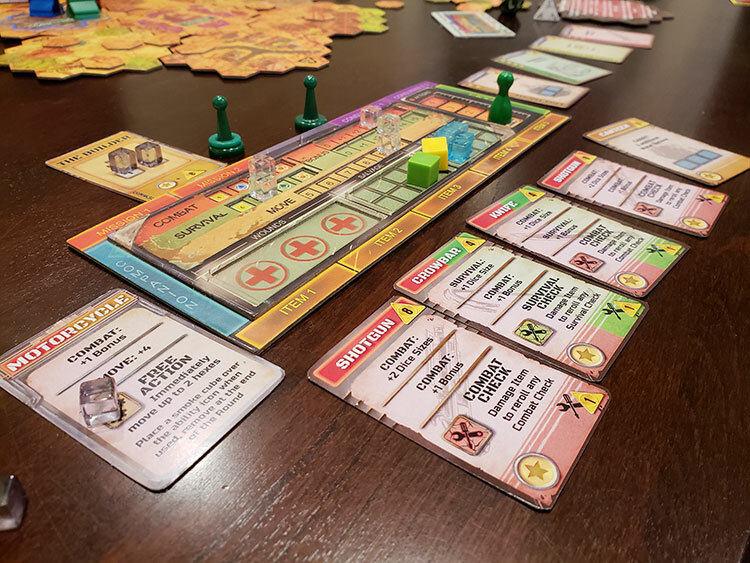 That said, I have since canceled this first campaign, and reached out to the BGG community for advice from those with more Kickstarter experience than myself. I will be restructuring the campaign and relaunching in 2019.